If you do not have princesses you may not be in line for Be Your Guest or Cinderella’s Table. But you may still be interested in character dining at Walt Disney World. Where should you look? Search no further than Africa – well, the African section of Animal Kingdom, that is. 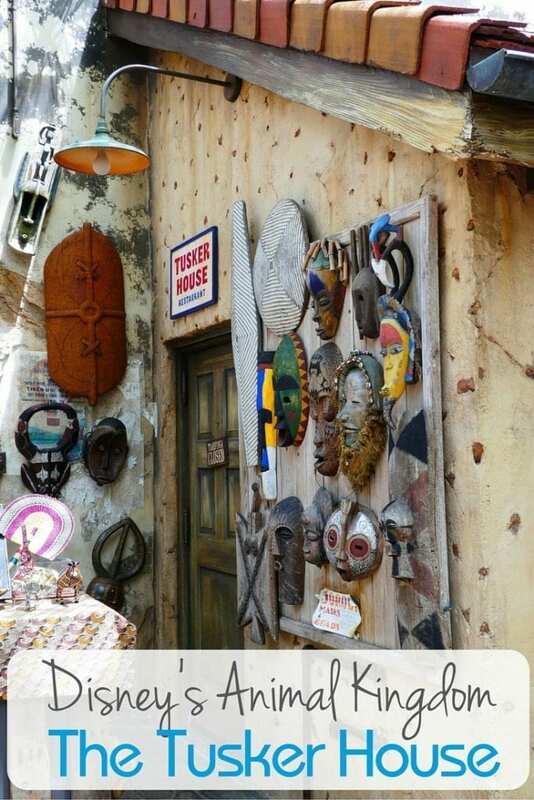 The Tusker House in Harambe is the perfect fit for most families looking for a good character line-up and a great meal! If you’re lucky enough to be visiting solo or as a couple, this is for YOU too! It’s not just about the characters here – Tusker House has the whole dining package! There are several reasons why Animal Kingdom is our favorite park. 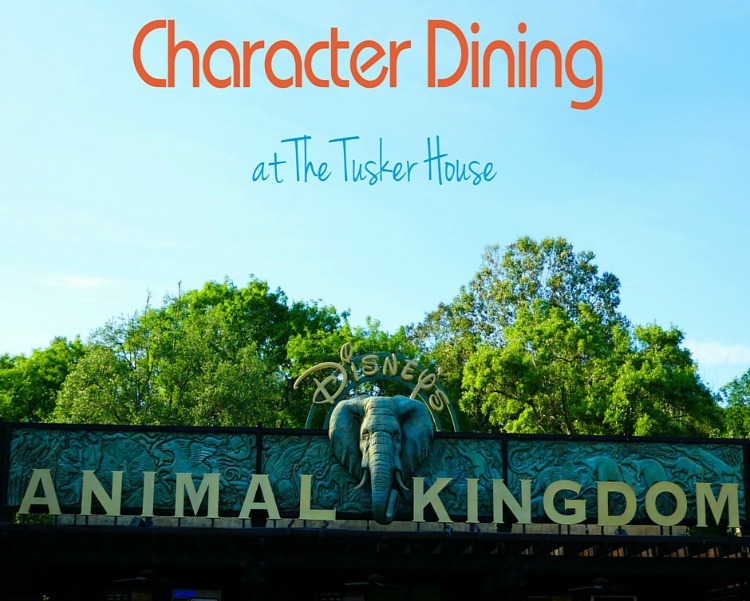 Our recent character dining experience at The Tusker House nestled in Africa in the Harambe village (and conveniently located near the Kilimanjaro Safaris) is just another reason to add to a long list of excuses to keep visiting this fantastic family park! Feast with your family while enjoying respite from the sun and a little visit from some of the most popular characters in Africa (and Walt Disney World)! The Peri Peri Marinated Salmon reigned over the buffet tables as family favorite. It has a little kick to it, but the balance with the fish and seasonings makes it easily manageable, even for my delicate palate. I must have had four pieces (yes, I’ll admit gluttony here!). I would love to know, though, if Disney has a sustainable source of salmon or if this is farmed fish. In spite of the delicious taste and presentation, I ate the same salmon at the Boathouse (slightly different seasoning) and at All Star Sports (no points for presentation, but again, basically the same fish), so I have my suspicions that Disney is using fish in bulk from a farmed source. It still tastes good, but having grown used to fresh from the sea salmon, I don’t think Disney has that kind of supply. Safron-infused root vegetables and cabbage was a side that I couldn’t resist. I love my roots! BUT, cabbage is loathsome. Still, it was a fantastic pairing and I went for seconds! Cape Malay Curry Chicken is another clear winner. As I was rounding the display for seconds (or thirds? who was counting anyway?) I overheard a kitchen worker making his rounds and speaking into a small microphone: “More salmon. More plantains. More roasted potatoes. More curry chicken.” So this was the pixie dust that allowed the trays to stay full and hot! I’m a potato girl, being from the rural Midwest and all, so when I saw not only a robust dish of mashed red potatoes but also potato wedges with gravy, AND a neat vegetarian potato pocket (Potato and Pea Samosas), I was stoked! Desserts were seriously lacking in my (sad panda) opinion. I live for sweets. I was so enthusiastically anticipating the chocolate lava cake that I was a little worried I hadn’t left enough room for it after the main fare. I was STUFFED. So, when I visited the dessert buffet table, I was really bummed to see I wasn’t even going to be able to try to pack it in — it wasn’t there! That delight must be reserved for the dinner crowd, which means they haven’t seen the last of me at The Tusker House! The chocolate chip cookies were not really any better than those able to be purchased in gas stations across the country. I enjoyed the peanut butter cheesecake bars and the spiced carrot cake was moist and delicious. Overall, the desserts would have been fantastic if I hadn’t had my heart set on the lava cake. I think Tusker shines in the main entrees and side dishes though. The African-inspired recipes are truly unique — especially if you’ve had your fill of Mickey Waffles and theme park food. Mini Corn Dog nuggets were arranged on our little ones’ plates in plenty – much to my dismay. I was hoping they would branch out and fill their plates with couscous and delicious fare that we aren’t afforded in the Midwest, but I’m really pleased, that while my kids’ choices were bland and common, some “familiar food” offered on the buffet! In addition to the corn dog nuggets there was a rich macaroni and cheese station, deli meats and cheeses, and even peanut butter and jelly to go on the assorted rolls and breads! We had a high chair delivered to our table right at check-in. There was plenty for our toddler to nibble (and of course, he’s a free guest everywhere inside Walt Disney World resort until he turns three!). Our preschooler was no problem either. I also loved the signage featuring Donald Duck along the buffet carts that said “Please remember the planet” (or something to that effect) and telling you to only take what you’ll eat. It was a fantastic talking point for a little learning tidbit while helping our big guy dish up. It was really nice to be guaranteed a visit by some of the most popular characters in the kingdom! It was especially nice not to have to stand in line. We were able to leisurely eat our food as we waited our turn for Goofy, Donald Duck, Daisy Duck, and Mickey to visit us. It went by really fast too! There were three or four seating areas within Tusker House and we had barely dished up our food when Donald came a-calling! I was really thankful to have my old reliable camera on-hand as well as my iPad. The winner for best shots ended up going to my day-old shiny, new Panasonic Lumix ZS60. I was able to set the camera to “pre-burst” mode and capture shots before AND after the click of the camera, so that when Donald’s arm blocked baby’s face or my son stuck out his tongue, I could bypass those frames and go straight to the smiles! Not only do the characters all stop by, the kind servers make sure that you’re satisfied with your shots and visits. You will sacrifice the presence of a PhotoPass photographer if you choose the African-themed food choices at lunch or dinner over the more American offerings at breakfast. For us, food trumped photos. Just know if you want family photos with characters, you’ll have to ask a nearby diner or a server to assist. Additionally, if you want the Mickey waffles, you’ll need to choose breakfast as well! It was a totally laid back experience. Our kind of Disney. We aren’t about to set alarms and throw elbows to eat with Cinderella. Sorry. Not our jam. This was an easy restaurant to snag a reservation for dining (I looked at changing it the night before and there were still ample opportunities.) It’s also fun to see the characters in full safari garb. If you’re an outdoorsy family that finds themselves in the heart of 40-some-odd square miles of people and commercialism, this is a pretty low key place to gather your wits and relax while refueling. For the lunch buffet, the cost is about $52/adult and for kids ages three and up it’s around $20. Under three, as always, are free as guests of Mickey. This is more of an investment to our family than “just a lunch.” For slightly more than $100 you are guaranteed a table visit by four characters — ours were Goofy, Donald, Daisy, and Mickey, all in safari gear. I think this is pretty much the regular line-up, but because its Disney, I’m sure they reserve the right to exercise their advertising “Donald and friends.” You get a fantastic meal – the Tusker House buffet has a great variety of American and African themed entrees and sides. The entrees are fair to good. Nothing super special, but still very tasty. The creative culinary genius was in the side dishes. Make sure to request “Jungle Juice” if you are taking in the lunch or dinner meals – it’s available upon request. Breakfast meals have a PhotoPass photographer present – you’ll have to do the capturing of Kodak moments if you dine after that. You also get shade! Climate control! Perfect for lunching up while it’s hot outside. The lighting was fantastic, as was the ambiance. The bathrooms were at least clean, albeit busy and a little messy, but not neglected. The restaurant grounds (the building is huge, it’s really like putting four separate dining rooms into one area) were airy and though the dining areas were partitioned off, it was done so without “blocking up” the space. The Tusker House is unique. The ceiling has linens – yes, they have material hanging all over in the market-themed buffet service area that is massive and has two levels. There are masks adorning walls. There’s a meat carving area. The aroma of exotic foods teases your nose as you walk in the door. This is a laid back and more relaxing experience than what I imagine Be Our Guest to be; however, it’s still four enormous rooms of dining families with many children running around and mingling with giant characters. It’s loud. But in a good way. It’s lively. This dining experience is an onslaught for all of your senses. It might just be your new favorite thing to do in the best park within the Walt Disney World Resort. At least its our family’s pick for best! If you are going to spend money on this character meal, try the dining plan. We debated and ended up NOT going with a Disney Dining Plan. That may have been a mistake. We would have not only gotten our table service meal at Tusker; we’d have gotten a quick service and snack as well. We DID spend over $100 on this one meal, but that is only slightly more than a normal sit-down meal for our family and it’s much better tasting than your typical chain buffet. 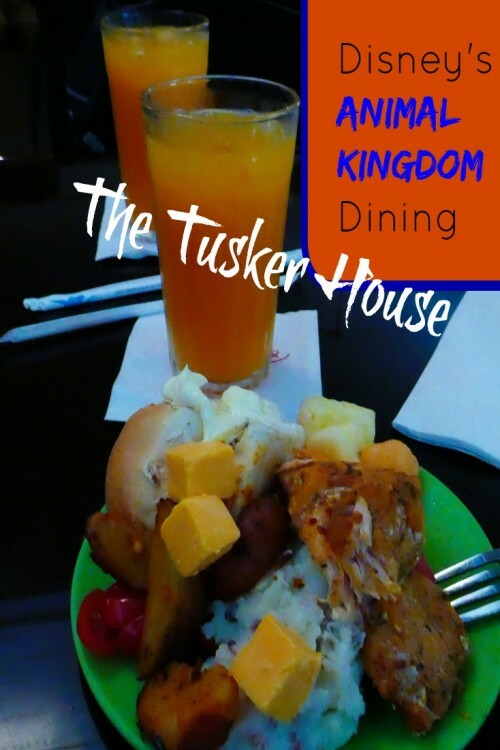 Tusker House served up a truly special experience and it was worth the price tag for our family. Straight from the mouth of the mouse, this recipe is so simple my preschooler made it for our pizza party dinner tonight! Mix equal parts orange juice, guava juice, and passion fruit juice. Best served over ice. Seriously. It’s that easy to recreate the delicious juice that is served in “Africa” in Disney’s Animal Kingdom at the Tusker House! Have you dined at the Tusker House? Have you had any character dining experiences at Disney? How was the food?! I appreciate your enthusiastic but balanced writing. Makes it easy to trust the praise when you tell me to downsides too.